As motorcycle enthusiasm increases in the United States and Pennsylvania, so too do the number of catastrophic motorcycle accidents and motorcycle crash wrongful death accidents. It is not uncommon for Lehigh Valley motorcycle riders to sustain severe personal injuries when involved in a motorcycle accident. Our Allentown motorcycle accident lawyers are here to help. Pennsylvania motorcycle accidents have 16 times the risk of personal injury and 35 times the risk of a wrongful death fatal crash compared with a car, according to U.S. National Highway Traffic Safety Administration (NHTSA). Our Lehigh Valley motorcycle accident attorneys are happy to meet you in Allentown City, Bethlehem, Easton PA or the greater Lehigh Valley PA after any motorcycle injury. Lehigh Valley motorcycle accidents contribute to serious injuries including spinal cord injuries, brain injuries, amputation and even wrongful death. Motorcycle accident victims may not be able to work and earn money needed to support their family or pay the costs of recovery. An experienced Bethlehem motorcycle accident attorney can help you receive just compensation for all of your personal injury damages, including pain and suffering along with any lost wages. An experienced Pennsylvania motorcycle accident lawyer at the Trapani Law Firm is happy to meet you any local Lehigh Valley hospital after a motorcycle accident injury. Motorcycle riders have little protection when colliding with a car or motor vehicle (whose driver is protected by seatbelts, airbags and the large metal frame of their vehicle). In addition, common road hazards such as potholes, black ice or slick roads provide much greater risk for motorcycle drivers than automobile drivers. Motorcycle drivers are exposed on their bikes with only a leather jacket and a helmet between their bodies and the pavement. Our Allentown motorcycle accident lawyers are available anytime for a free consultation if you’ve been in a motorcycle accident in the Lehigh Valley Pennsylvania. In most Allentown or Bethlehem motorcycle accidents, the point of impact is the front of the motorcycle, which usually results in the most catastrophic personal injuries or even Pennsylvania wrongful death. The resulting damages are severe, including physical pain and suffering, costly medical bills, lost wages and emotional distress. 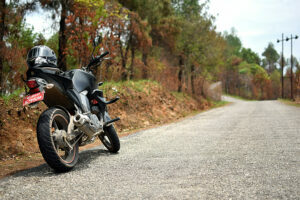 The stress is compounded if the motorcycle accident was due to another driver’s negligence. After experiencing personal injury as a result of a motorcycle accident, call the Trapani Law Firm. Our Lehigh Valley motorcycle accident lawyers offer free consultations anytime, day or night. At the Trapani Law Firm, our Easton motorcycle accident attorneys fight for innocent riders who have experienced personal injuries as a result of careless drivers. We have a track record for success in ensuring fair compensation for injured motorcyclists. We’re the Lehigh Valley personal injury lawyers you can trust after experiencing a motorcycle accident in Bethlehem, Easton or Allentown Pa. If you have suffered a personal injury in a Lehigh Valley motorcycle accident you need an experienced Allentown motorcycle accident lawyer representing your interests. Many motorcycle accidents result in severe Lehigh Valley personal injury and even Pennsylvania wrongful death. As a result, motorcycle accident damages can include: pain and suffering, lost wages, expensive medical bills, property damage and even the wrongful death of a loved one. More often, the driver of a car or truck may be at fault due to distracted driving. Our Bethlehem motorcycle lawyers have experience and knowledge proving liability of the at-fault driver to help our motorcycle accident victims get back on their feet financially and physically. Call an experienced Pennsylvania motorcycle accident lawyer anytime for a free consultation. We work with a team of experts in the field of motorcycle accident reconstruction, vehicle accident injury, motorcycle insurance, psychology, and economics to attack a case from every direction. Our motorcycle accident lawyers are trained to identify every party responsible for an accident and uncover every available insurance policy. Whether you are suffering from physical pain and suffering, lost wages from time out of work, or even the wrongful death of a loved one, if you are entitled to compensation, the Easton motorcycle attorneys at the Trapani Law Firm will fight for your rights. Call an Allentown personal injury lawyer anytime for a free consultation. Our Pennsylvania motorcycle accident lawsuit attorneys are happy to meet you in your home or local Pennsylvania hospital, if that is more convenient. If you are located in any of the following cities our lawyers can meet you at a moments notice: Allentown PA, Altoona PA, Bangor PA, Bethlehem PA, Catasauqua PA, Easton PA, Emmaus, Hershey PA, Lehigh Valley PA, Macungie PA, Nazareth PA, Northampton PA, Pocono PA, Reading PA, State College PA, Stroudsburg PA, Whitehall PA, Wilkes-Barre PA, York PA and Phillipsburg NJ. Call us anytime for a free motorcycle injury accident consultation. If you or a loved one has been injured in a motorcycle accident, contact an Allentown motorcycle accident lawyer at the Trapani Law Firm. Our experienced team of personal injury attorneys will protect your interests and provide a free consultation. We’d like to help. Call us today at (610) 351 – 2330 or contact us. Motorcycle Accidents	Overall rating:	5	out of 5 based on 10	reviews.